internal heat exchanger, this regulator is an excellent choice for divers exploring the most extreme cold water environments. 1st stage T overcompensation diaphragm is ultra modern, but at the same time easy to manage, very reliable and durable. A PVT coating protects the 1st stage from erosion, wear and tear. The T configuration enables better integration of the first stage in the profile of the valve, and thus greater freedom of movement of the diver’s head. The mechanism works transversally, supplying air and filtering potential particulates coming from the tank that manage to pass through the filter, so that they do not directly affect the valve. 1st stage overcompensation diaphragm is ultra modern, but at the same time easy to manage, very reliable and durable. The HP saddle is made from AISI316 stainless steel. The T10 has an isolation and anti-freeze SC (Sealed Chamber) kit that completely isolates the diaphragm and the spring from contact with the water, making it ideal for use in extremely low temperatures and dirty waters. Effective filtered surface area of 280 mm2 thanks to its special design. 2 HP and 4 LP ports. Provided in INT (yoke) and DIN 300 bar. The threading of the DIN version is in stainless steel instead of brass to guarantee better resistance against drops or bumps. New ultra simplified monocoque second stage in ABS + elastomer + STAINLESS STEEL, quite small (6 cm in diameter), very light (153 g) and robust, designed and built to have a minimum number of components. It is a smart buy due to its combination of performance, reliability, price and cost of maintenance. It is perfect for uses requiring maximum reliability and as a travel regulator, given its lightness. In the Pro version, the body of the integrated 2nd stage incorporates particles to improve thermal conductivity and to prevent freezing in cold environments. CE Standardization for use in cold water (>4º) EN250/2000. This feature adds a scant tendency to freeflow on the surface and when positioning the equipment in the water, ideal for schools and rentals, octopus and double regulator. Cap system assembly by a 30º bayonet turn, assuring a very safe and simple assembly-disassembly, even while cleaning out sand on the beach, without the need of tools. 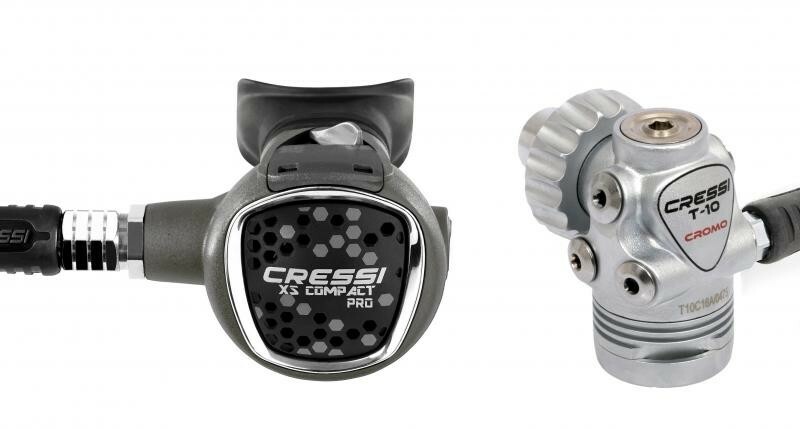 Click the button below to add the Cressi Sub T-10 SC/Cromo Compact Pro Regulator to your wish list.